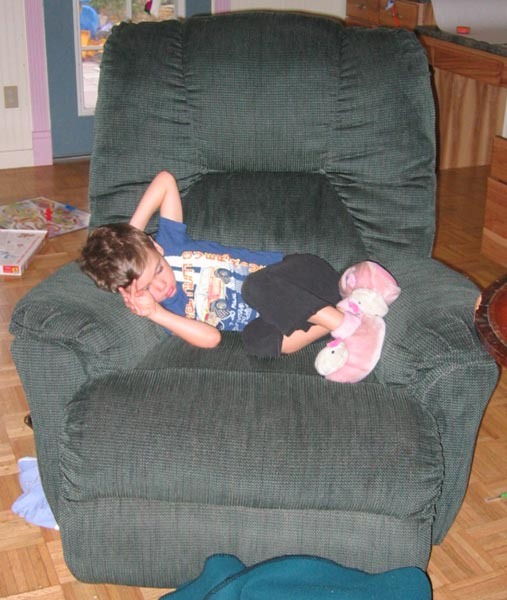 The GREEN CHAIR is almost the bain of my existence as a mother. Rob bought it without consulting me. It’s not what I would have picked out, but it’s not the end of the world to me style-wise either. It’s not like we have a style in my house … well, maybe the a-bomb-just-went-off style. The real problem is that he only bought one, and we have 2 children who are constantly fighting over who gets the the green chair. I have another cushy recliner type of chair on order; it should be ready in 6 weeks or so. It’s different from this chair, but hopefully, it will solve the problem of the GREEN CHAIR. « More on the VA site.